The UK’s largest coastal management scheme, carried out by Team Van Oord on behalf of the Environment Agency, has been named a winner in a prestigious industry award presentation ceremony on 3 July, and is in the frame for another award later this year. The Steart Coastal Management Project* picked up the top award in the 2015 ICE South West Civil Engineering Project of the Year Awards, and has been shortlisted in the 2015 BCI Awards. The ICE South West Civil Engineering Project of the Year Awards recognise construction projects which stand out for their physical achievement, innovation or ingenuity, and promote excellence in the engineering profession. Entries are judged by ICE fellows and the winners were announced at the annual awards ceremony on 3 July. The Steart Coastal Management Project was ‘Highly Commended’ in the Community Award category. The ICE shortlisting describes the scheme as “a £20.7m feat of civil engineering skill, determination and dedication extending over 477 hectares of land on the Steart Peninsula”. At the culmination of the ceremony, the scheme went one step better in being named winner of the Members Award, which gives ICE members in the South West the chance to choose their favourite project of the year. The submission focuses on the community-influenced design of the project and the early and continuous support from the Wildfowl & Wetland Trust to deliver a community-minded wetland nature reserve. Community groups, technical groups and specialist volunteers were involved in shaping a true ‘community vision’ of Steart Marshes, and the project team managed construction phases to sympathetically work with the local community in order to avoid disruption. The project has secured a much-sought-after future for the local community that combines protection from flooding, a farmed landscape and space for public engagement. Commenting on the ICE Award win, Dr Rachel Burden, Somerset Flood Action Plan Manager, Environment Agency, said: “It was a fantastic result for the team and well deserved. The shortlisting in the BCI Awards 2015 is in the Major Civil Engineering Project of the Year category. The Steart scheme is up against five other projects commissioned by Yorkshire Water, Network Rail(2), Crossrail and Sita UK. The BCI Awards will be presented on 15 October at Grosvenor House Hotel in London in front of an audience of more than 1,200 industry key players. Team Van Oord and the Environment Agency achieved unprecedented success in the 2014 BCI Awards. The partners received two awards, including the top award of the night, The Prime Minister’s Better Public Building Award, which is sponsored by The Cabinet Office. The other win was the Civil Engineering Project of the Year Award. Both awards were for the Medmerry Managed Realignment Scheme in West Sussex. These two nominations are the latest in a string of accolades the Steart scheme has received. In April 2015 the scheme won an Environment Agency Project Excellence Award; in 2013 it received a ‘Gold’ Green Apple Award and won the Environment Agency’s Health, Safety and Environmental Exemplar Award. A year earlier, in 2012, following a visit by an assessor from the Considerate Constructors Scheme, the Steart project was deemed an “exceptionally good site” having achieved a score of 37 out of a maximum of 40 points. The £21m Steart Coastal Management Project will help protect homes and businesses from flooding due to climate change and rising sea levels, and has established a new nature reserve. The project is located next to the Severn Estuary on the Steart Peninsular, surrounded by internationally and nationally designated nature conservation areas forming part of the Severn Estuary Special Protection Area (SPA), Special Area of Conservation (SAC) and Site of Special Scientific Interest (SSSI). A new channel was created to deliberately flood 300 hectares (740 acres) of land to provide much-needed habitat for wading birds and wildfowl, and for water voles and great crested newts. 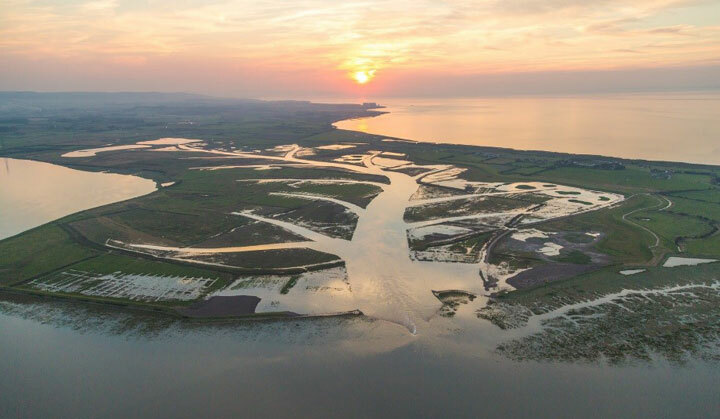 The Environment Agency has national and international obligations to create intertidal habitat on the Severn Estuary to compensate for losses that are expected due to coastal squeeze, and the Steart Coastal Management Project will provide 40% of the required offset habitat for the area.